America’s finest silver is displayed in all its glory with the 1987 American Eagle Silver Dollar. Every year savvy buyers stash these away. Each is struck in one ounce of 99.9% fine silver and is in Brilliant Uncirculated (BU) condition. 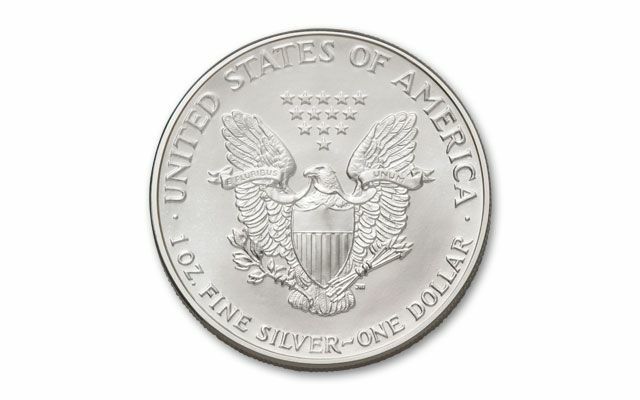 Silver Eagles were offered by the U.S. Mint for the second time in 1987. Unlike the previous year, in which Silver Eagles were sold only in November and December, 1987 Silver Eagle bullion coins were available for purchase the entire year. 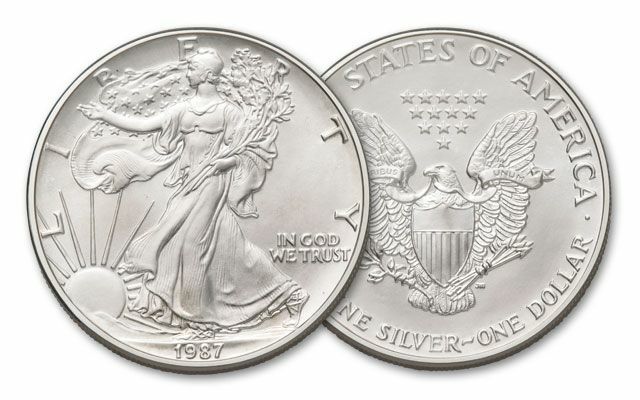 As a result, a record 11 million 1987 Silver Eagle bullion coins were sold. It was a record that would not be broken for more than 10 years. 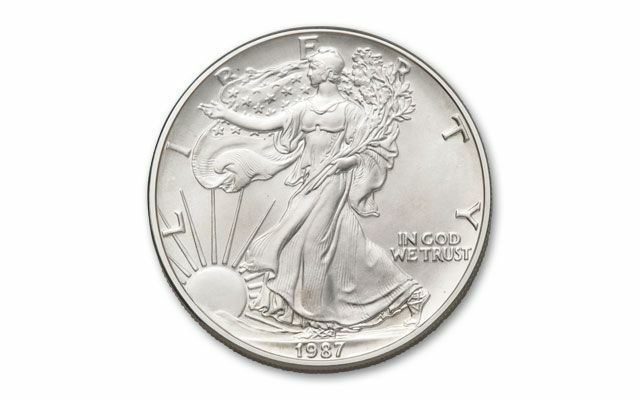 Silver Eagle proofs were also minted in 1987, although in lower numbers than the Silver Eagles' inaugural year. The 1987 Proof Silver Eagle bears the "S" mint mark, indicating that it was struck in San Francisco. All American Silver Eagle coins are guaranteed by the U.S. government for weight, content and purity. Silver Eagles are non-reportable. If those aren't reasons enough to purchase a 1987 Silver Eagle, just take a closer look at the sheer beauty of the coin. With its sweeping image of "Walking Liberty" on the obverse face—and the heroic eagle on the reverse—the Silver Eagle is widely considered one of the most beautiful American coins ever struck. The overall average price of silver during 1987 was $7.01 per ounce.